Over the weekend I laid out another appliqué block for my Dressed for Dinner quilt and it is ready for sewing. 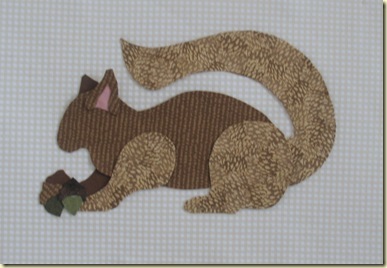 The squirrel was a very simple block to layout and I believe the sewing will go quickly too. I am going to machine appliqué it. I also sewed up more of the half-square triangle dividers. These go in between the blocks. I’ve been making a lot of progress on this lately. If I keep up this pace this quilt will actually be done by fall!! I’m impressed beyond words. Your fabric choices are impeccable and your stitching precision is incredible.